Looking to book David Chang for a corporate event, private party, fundraiser or public event worldwide? BookingEntertainment.com makes it easy and trouble free to check availability and pricing for booking David Chang or any other act in the business with absolutely no obligations. Booking Entertainment is the leading entertainment booking agency specializing in booking David Chang. We will be happy to help you get David Chang's booking fee, or the price and availability for any other band, comedian or celebrity you may want for your corporate event, birthday party, wedding, fundraiser or public show. At Booking Entertainment, we put our 23 years in business behind you to help you get the best price for any entertainer, comedian or celebrity for your event. In addition, our team of seasoned industry professionals can handle every aspect of the entertainment portion of your event to make sure the entertainment runs flawlessly. If you are wondering how to book David Chang for your event, you can trust our David Chang agent to handle it for you. Find out why Fortune 500 companies, high net worth individuals and fundraising organizations come back to Booking Entertainment year after year for their entertainment buying needs. We can literally book any act for you anywhere in the world. David Chang’s rise to become one of the era’s most famous restaurateurs is nothing short of extraordinary. Born in Vienna, Virginia in 1977, David spent his childhood observing his Korean parents working at the various restaurants they owned throughout the suburbs of Virginia. Clearly, the seed was planted for a future in the culinary arts, but as a child Chang was more interested in competitive golf and other pursuits. After graduating from the prestigious Georgetown Preparatory School, David entered Trinity College to pursue a degree in Religious studies. Following graduation, Chang began working in the financial field, but found himself quickly disappointed with the environment; clearly, working behind a desk was not going to satisfy such a creative and innovative talent. That talent and innovation would eventually be realized through one of David Chang’s earlier passions – culinary arts. While studying abroad during his time at Trinity College, his experiences in London led him to envision a career in the field, but at the time Chang did not heed the calling right away. That changed a few years later, when he enrolled as a student at the International Culinary Center, pursuing a course of study in Classic Culinary Arts. Chang’s experiences while a student at the International Culinary Center brought him to Japan, where he refined his creative approach to the noodle dishes which would eventually make him famous. He also spent time in the New York kitchens of Craft Restaurant ( Tom Colicchio) and Mercer Kitchen (Jean-George Vongerichten.) After graduating, David Chang set out to turn the culinary world upside down, starting with Momofuku Noodle Bar, in 2004. To say that Momofuku Noodle Bar was a hit would be an understatement. Momofuku, meaning “lucky peach,” became a smash hit upon its opening in the East Village area of New York City. 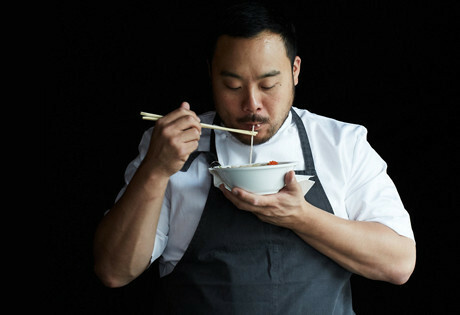 By 2008, David Chang had opened Momofuku Ssäm Bar and Momofuku Ko, his famous twelve-seat, reservation-only restaurant. Ko is known for it’s strict table-booking policy - no more than ten days in advance - making it one of the nation’s most in-demand restaurants for both the ordinary New Yorker and the influential and famous alike. Since opening, Ko has received two coveted Michelin Stars every year, and is listed among the world’s most influential restaurants. Next was Momofuku Milk Bar, and since that opening, David Chang has also opened six additional restaurants in New York, five of them Momofuku Milk Bar in different locations. He has also opened restaurants in Toronto, Australia, and Washington, DC. His awards and accolades are too numerous to list in their entirety, but so far include nine James Beard awards and six S. Pellegrino awards. Chang was also listed as one of Time’s 100 Most Influential People in 2010. In 2009, in collaboration with Peter Meehan of the New York Times, David Change published his much anticipated cookbook, Momofuku, sharing various recipes form his restaurants. A quarterly food magazine, Lucky Peach, followed in 2011 and has included such notable contributors as Ruth Reichl, Anthony Bourdain, and Harold McGee. Most recently, David Chang served as a guest judge on Top Chef: All Stars, and he and Anthony Bourdain also produced the sixteen-part PBS series, The Mind of a Chef. In addition to further growing his Momofuku empire, David Chang serves on the board of New York City’s Edible Schoolyard, advocating for the slow-food movement, something which he features in all of his restaurants, choosing local farmers and local ingredients for his menus. For more information on booking David Chang, please contact Booking Entertainment. One of our top booking agents will be happy to work on your behalf to get you the best possible price to book any big name entertainer for your upcoming public, private or corporate event worldwide. The agents at Booking Entertainment have helped clients book famous entertainers like David Chang for private parties, corporate events and public shows around the world for over 23 years. Our agents will be happy to assist you with any of your famous entertainment buying needs. All you need to do is fill out an entertainment request form or call our office at (212) 645-0555, and one of our agents will help you get pricing information and available dates for David Chang or any other A-list entertainer for your next event. How to book David Chang for a corporate event? Booking David Chang for corporate events is a great way to thank your employees and clients, and in addition, hiring David Chang for a corporate event is a fantastic way to promote your company's image to your industry. Booking Entertainment can book David Chang for corporate events worldwide, providing you with the fee to book David Chang and their availability on your specific date. We have helped our clients book David Chang and thousands of other acts for almost 25 years. Whether you are looking at hiring David Chang for a corporate event, product launch, trade show, holiday party or an employee appreciation event, your assigned Booking Entertainment agent will be happy to get you the best price for booking David Chang and help make sure that every aspect of the entertainment portion of your corporate event is executed flawlessly. How much does it cost to book David Chang for a corporate event and what do the fees for booking David Chang include? If you are looking to hire David Chang for a corporate event and are looking for David Chang’s booking fee for corporate events, Booking Entertainment will be happy to get you pricing to book David Chang for your date for free. The cost of hiring David Chang for your corporate event can include just the price of booking David Chang for a corporate event, or we can give you an estimate for booking David Chang that includes absolutely everything that goes into hiring David Chang including all fees, flights, hotel, ground, production, green room requirements and our veteran production team onsite to make sure everything runs smoothly from load in to load out. How Much Does It Cost To Hire David Chang? Looking for David Chang booking cost, fee or pricing? When you are booking an act like David Chang, many factors determine the final price, including the artist's touring schedule and other shows they may have in your area. Fill out an entertainment request form or call our offices at (212) 645-0555 and one of our booking agents will get you a pricing fee and availability for your date and assist you in booking David Chang or a different well-known act for your next event. How Do I Hire David Chang For A Private Party? Wondering how much does it cost to book David Chang for a private concert or will David Chang play a private party? Whether you are looking to book David Chang for a wedding, private party or anniversary party, our David Chang booking agent who specializes in booking David Chang will be happy to help you to book David Chang and take care of everything necessary to make sure the show is executed flawlessly. Fill out an entertainment request form or call our office at (212) 645-0555 and one of our David Chang booking agents will assist you in hiring David Chang for a private event anywhere in the world. How do I hire David Chang for a college concert from booking agencies that book concerts for colleges and universities? Booking talent for college and university events is something Booking Entertainment has been helping college talent buyers do for almost 25 years. Whether you are looking to book David Chang for a sorority party / fraternity party or a college concert event sponsored by the college entertainment committee, college talent buying is something we specialize in at Booking Entertainment. Simply fill out our form, email us or call the office and one of our college booking agents will be happy to help you make sure that every aspect of booking David Chang or anyone else for you college event is taken care of to ensure your college or university concert runs smoothly and cost effectively. How much does is it cost to book David Chang for a college or university concert and are fees for booking college concerts less expensive? When college entertainment buyers book famous entertainers such as David Chang to play for college concerts, sorority parties or fraternity parties at colleges and universities, we know the acts tend to charge a lower fee than they would cost for a traditional public or private concert. Of course, how expensive it is to book college entertainment depending on how big of an act they are, but colleges and universities tend to get a better fee for booking big name entertainment for college and university events. One of our college entertainment booking agents will work closely with you to make sure you get the best possible price for your college’s concert. Buyers who don't have a lot of experience booking famous acts often find the process frustrating when they try to do it on their own. Our David Chang agent that specializes in booking David Chang can use our reputation and relationships to help you navigate the entertainment buying process and get your offer for booking David Chang seriously considered. The artist’s managers want to know that everything will be handled properly, and Booking Entertainment’s stellar 23-year reputation and our attention to detail provide them with the peace of mind that the show will be flawlessly executed from beginning to end. How Do I Book David Chang For A Fundraiser or Gala? Wondering how much does it cost to book David Chang for a fundraiser or will David Chang play a gala? Your assigned David Chang agent will be happy to help you to book David Chang and we can even take care of everything necessary to make sure booking David Chang is easy and trouble free. Fill out our entertainment request form or call our office at (212) 645-0555 and one of our booking agents for David Chang will assist you to book David Chang or any other entertainer or celebrity for your next fundraiser or gala anywhere around the world. How Do I Book David Chang To Perform At My Wedding? You might ask yourself, “How do I hire David Chang for a wedding?" We have helped hundreds of clients book acts like David Chang for weddings and wedding ceremonies worldwide. Your assigned Booking Entertainment agent will not only be happy to assist you in hiring David Chang to perform at your wedding, we will be onsite to make sure booking David Chang for your wedding is executed flawlessly. Can I book David Chang for a wedding and how much does it cost to book David Chang to sing at a wedding? If you are serious about booking David Chang for a wedding, Booking Entertainment will gladly get you the David Chang booking fee and availability for booking David Chang for your wedding date. The price for booking David Chang will include all of the fees and additional expenses necessary to hire David Chang for a wedding including all production costs, flights, hotels, ground and green room requirements. If I hire David Chang to perform at my wedding, how do I integrate booking David Chang into my wedding? Hiring celebrity entertainment for a wedding is a great way to surprise the guests or even the bride or groom. When we book big name acts like David Chang for weddings, we work closely with the wedding planner beforehand to make sure everything involved with the entertainment integrates seamlessly with the flow of the wedding . Our staff of veteran producers will then be onsite at the wedding to make sure when you book David Chang for your wedding, everything runs smoothy from load in to load out. How do I contact David Chang’s agent or David Chang’s manager? Even if you have David Chang contact information, David Chang’s management contact info like David Chang’s manger's email or even David Chang’s manager's phone number, you still need a company like Booking Entertainment to help coordinate everything that is necessary to book David Chang to perform for your event. Agents and managers contact us all the time to help people that find the agency contact info or management contact info and contact the agents and mangers directly. Managers and agents trust our agency to handle everything to the industry standard as we have for almost 25 years. How Do I Book A VIP Experience With David Chang At A Event Or Concert? With Booking Entertainment, booking premium seats and backstage meet & greets with David Chang is easy and accessible to anyone around the world. Fill out an form or call our office at (212) 645-0555 and one of our agents will assist you to get pricing and availability to have David Chang VIP experience at a concert or event. Booking Entertainment works to get the best possible David Chang booking fee and David Chang price for our clients while also providing the celebrity or famous entertainer with the level of professionalism and industry norms that they expect from an event run by a professional booking agency and production management. Booking Entertainment uses our agency / management relationships and over 23 years of production experience to help buyers of headline / top name entertainers and does not claim or represent itself as the exclusive David Chang agent, manager or management company for any of the artists on our site. Booking Entertainment does not claim or represent itself as the exclusive booking agency, business manager, publicist, speakers bureau or management for David Chang or any artists or celebrities on this website.